It’s pretty much safe to say that Jennifer Aniston has the most requested hair in Hollywood. 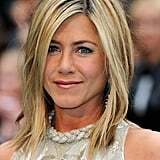 Even after The Rachel’s fall from style, Aniston’s hair remains the most watched coif on every red carpet. But surprisingly, the Dumplin’ actress rarely attempts to wow us with overdone updos or out-there highlights. Instead, she keeps it simple by sticking to sun-kissed waves, ponytails, and braided looks — a casual girl through and through. In honor of her 50th birthday, we’re looking back at her hair history so that you can steal her no-fail hair formula for yourself.